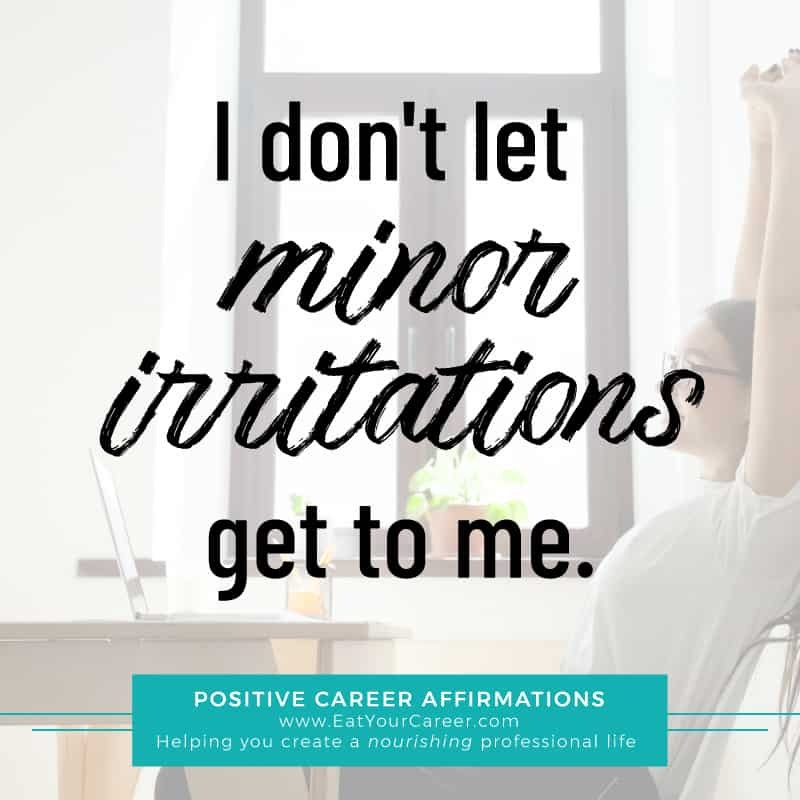 I don’t let minor irritations get to me. As a professional speaker and corporate trainer, I’m often mistaken for one of those rare “naturally confident” people. However, like most of the world, I’ve had to work at it. Contrary to what you might believe, confidence and self-esteem are rarely natural traits. Instead, they are skills that can be learned through practice. The dirty little secret that no one talks about is this: research shows that nearly 100% of mentally healthy people will struggle with self-confidence to one degree or another. In fact, some research even suggests that the people who don’t ever worry about what others are thinking of them actually land somewhere on the spectrum of sociopathic or even psychopathic. If you are a compassionate, empathetic and conscientious individual, you will likely experience times when you lack confidence. Most of us are conscious of (and concerned with) how others view us—and for good reason, especially in the workplace. The perceptions others have of us can impact how they treat us and the opportunities they afford us. Still, we don’t want to place too much weight on the opinions of others. We want to be confident in who we are, what we do and how we do it, regardless of what others think. Interestingly, the more confident we are, the higher regard people tend to have for us. So, how do we balance all of this? How do we manage the little voice in our heads that tells us we’re not good enough and we don’t measure up? How do we pay attention to our reputation without allowing the opinions of others to define us? How do we create the kind of confidence that is real and lasting? In this month’s webinar, I’ll answer all of these questions and more. 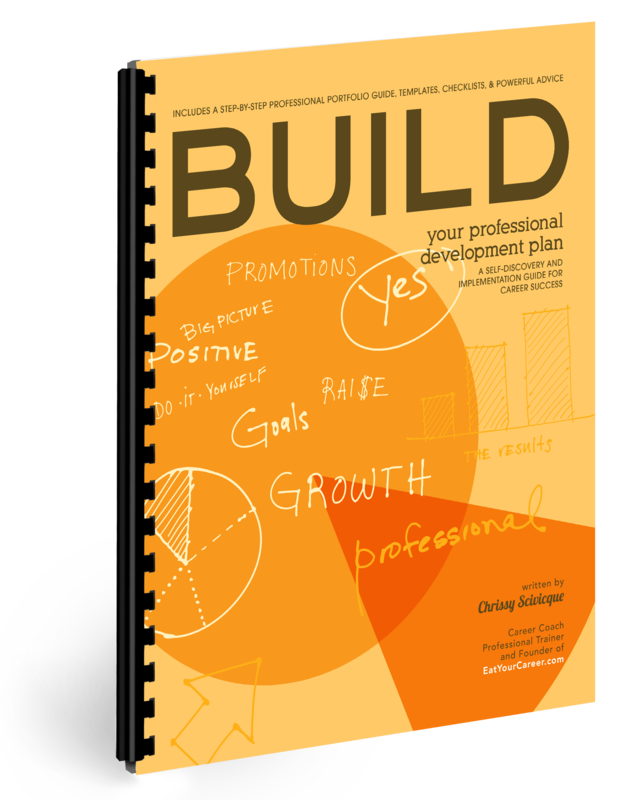 If you’ve ever felt like some kind of imposter, or worried that everyone else knows something you don’t, or stayed awake at night feeling inferior and anxious about your professional future, this session is for you. This is a question I get quite frequently in my monthly “Ask the Career Coach” sessions. It’s not surprising; people who are in the midst of a job search are always anxious. They want the process to be much faster than it (usually) is. The longer it takes to land that new gig, the more self-doubt starts to creep in. So, at what point should you start to worry? 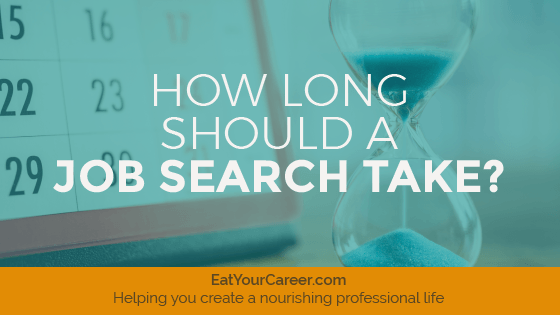 How long should a job search take on average? Expect one month of job search for every $10,000 of income you expect to earn. Therefore, if you’re expecting to earn an annual salary of $60,000, you should plan for a 6-month job search. The big lesson here is to give yourself a lot of lead time! The hiring process isn’t something that happens overnight. Again, this is a “rule of thumb,” so it’s not precise. Your job search may take a little longer. 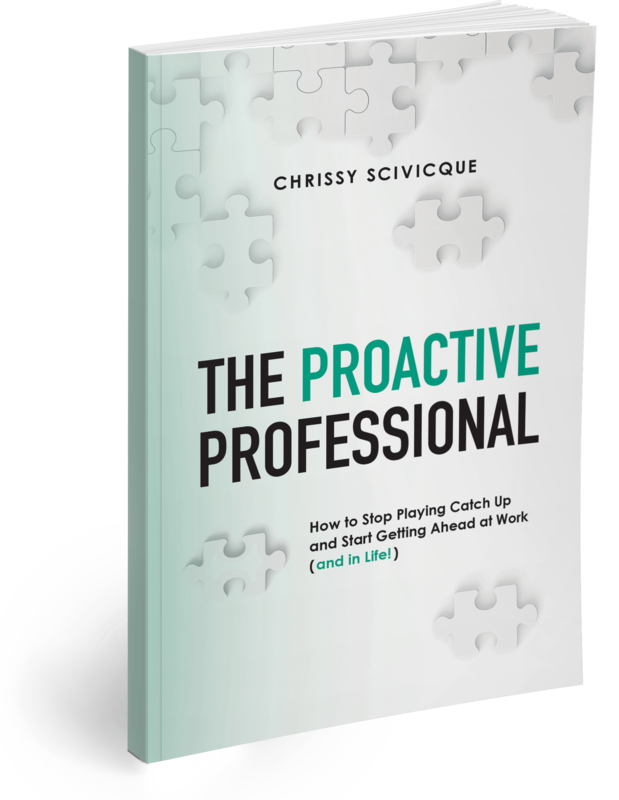 This is especially true for professionals at the executive level and those in fields that are oversaturated or limited in the number of opportunities available. However, if you have a strong resume, a robust network, and good interview skills, you could land something sooner. There’s no perfect formula to predict timing; it all depends on your unique situation. As a career coach, one of my goals is to help my clients reduce the time it takes to land a new job as much as possible. But there are a lot of factors that fall outside of the job seeker’s control. You never know what might happen…The job you thought was your perfect match? Maybe that department lost their budget for hiring, or maybe they identified an additional aspect of the job that suddenly takes you out of the running. The manager who said they were almost ready to make you an offer? Maybe they found a more qualified candidate at the last minute—or maybe the boss’s nephew got the job. From the outside looking in, you simply can’t expect to understand or predict the how’s and why’s of the hiring process. As a job seeker, you’re truly at the whim of the hiring organization. It’s a hard place to be, I know. But that’s the nature of the beast. Things change in the blink of an eye, and often, you never even know what happened. You just know you’re still job searching. It can feel like a never-ending trudge up a steep mountain. Just remember that it’s not supposed to be fast. You’re not (necessarily) doing something wrong if it takes a while to get some traction. Don’t let yourself get consumed with stress and negative thinking. That will only delay the process more! That being said, if you’re concerned that something within your control might be slowing you down, consider working with a career coach. Perhaps a slight tweak to your resume, or a minor adjustment in your search strategy, or a different approach to interviewing is all you need to get some positive results. There’s never a guarantee, but, if you haven’t ever worked with a job search professional, the chances are pretty good that you have some room for improvement. It’s not your fault. No one would expect you to be an expert at this stuff. It’s not what you do for a living! That’s why you can hire someone like me. This is my job, so I know the intricate details and unwritten rules that the average job seeker would never know. You can learn more about my Job Search Accelerator Coaching Program here. Finally, let me just acknowledge that job searching is an emotional process. It’s full of ups and downs—moments of exhilaration and excitement, as well as moments of disappointment and frustration. Try your best to keep a level head. Don’t allow the time factor to play tricks with you. Keep a steady pace and continually look for ways to improve what you’re doing. The right opportunity will show up if you just stay focused. By the way, if you’d like to be notified of my FREE monthly Ask the Career Coach sessions and career training webinars, please sign up here. 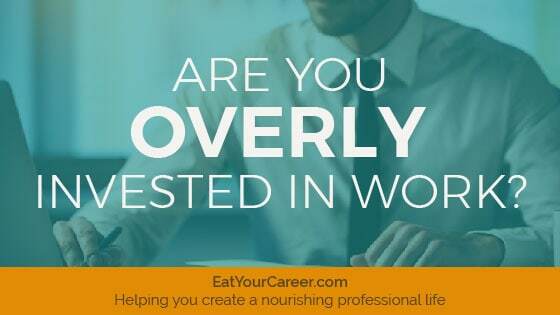 Are You Overly Invested in Work? The philosophy behind Eat Your Career is that work can be a nourishing, enriching life experience. That’s a tall order, I realize. I really do believe that work is a very important part of life. When you’re not happy with your career, it can impact all other areas of life. Your mental, physical and emotional health can suffer. Your relationships and financial security can suffer. Your whole world can become more difficult and painful. I know because I’ve personally experienced it. But I also believe that we have to keep perspective. For many years, I placed too much importance on my career. I was overly invested. That meant, when things were going right, I was on top of the world. When things were going wrong, I was in the absolute pits of despair. I let my career happiness dictate my life happiness. That’s not the goal. Yes, your career is an important part of your life. But it’s not the ONLY important thing. It’s not even the MOST important thing—though it might feel that way at times. [Read more…] about Are You Overly Invested in Work?